Is Tajik a dialect of Persian? Or a language in its own right? What differentiates it from varieties prevalent in Afghanistan and Iran? There is no easy answer to these questions because the very categories we use to think about language in Central Asia, and elsewhere, are insufficient. Consider these paradoxes: A student trained in modern Persian at an American or European university would have no trouble understanding Tajik-medium news on the radio, even though he or she would initially be unable to read the Cyrillic script of print publications. And at bazaars in places such as Bukhara or Khujand, the language encountered — still ostensibly Tajik — would be near incomprehensible to someone with knowledge of “colloquial Persian.” The same goes for Afghanistan and even Iran itself. The formal language of the media is virtually identical (excepting the alphabet in the Tajik case) across borders, while the spoken dialects vary tremendously on a city-by-city, village-by-village basis. This basic insight is taken for granted by scholars with years of experience studying Persian (by its various names) and living in Iran and Central Asia. But it is a language framework missing from most Persian textbooks and actively subordinated to an explicitly national way of understanding language dynamics in the region. The language categories we are more or less stuck with are organized vertically by nation-state, which at once obscures the profound variation of local dialects (Mazandarani, Bukhari, Kabuli, and many others), while simultaneously implying deep differentiation by country that does not in fact exist, among Farsi, Dari and Tajik. Prior to the 20th century, Persian served as a remarkably uniform language of high culture from the Balkans to western China, in no way confined to the modern country of Iran. Much like Latin in Europe or Sanskrit in India, it was a literary language that many educated people could write, but far fewer spoke as a native tongue. Crucially, the language was known as Persian (Farsi) everywhere, and the written language formed the basis for the modern languages of Dari and Tajik as well — terms rarely used to describe a language before the 20th century. (“Tajik” was used to refer to people, but not language; and “Dari” was used in medieval texts to refer to Persian, but without any exclusive relationship to modern Dari or Afghanistan, despite nationalist claims to the contrary). So if literary Persian formed the basis of all of these languages, just what is so Tajik about the Tajik language? (The same point applies to Dari and Farsi). This question is complicated by the inadequacy of our categories. If one has in mind the formal Tajik of the media and language textbooks, the answer is “not much,” aside from the alphabet. And a separate alphabet does not a language make: otherwise the recent script reform in Uzbekistan from Cyrillic to Latin would have effectively invented a new language. A smattering of grammatical forms specific to Central Asia though not necessarily exclusive to Tajikistan were codified into grammar manuals during the Soviet era, and consequently survive in contemporary English-medium language textbooks. For instance, “man rafta istāda būdam” (“I was going”) appears alongside the literary variant, even though that construction would make little sense in Tehran. Vocabulary is overwhelmingly etymologically Persian, with Turkic and Russian loanwords mostly excised from such language manuals. Students who master the contents of Tajik textbooks — the most widespread options are by Baizoyev and Khojayori respectively — would therefore be prepared to converse with well-educated colleagues in Iran, Tajikistan, and Afghanistan. In other words, the predominant pedagogical approach is a good fit for diplomats, journalists, and literature scholars. Step outside the elite circle, however, and this picture changes dramatically. If by “Tajik” one has in mind the language of the hearth and bazaar, then it turns out there are many varieties of Persian. Dialects common in Central Asia freely mix not only Persian, Turkic, and Russian words, but grammatical forms and sentence structure as well. 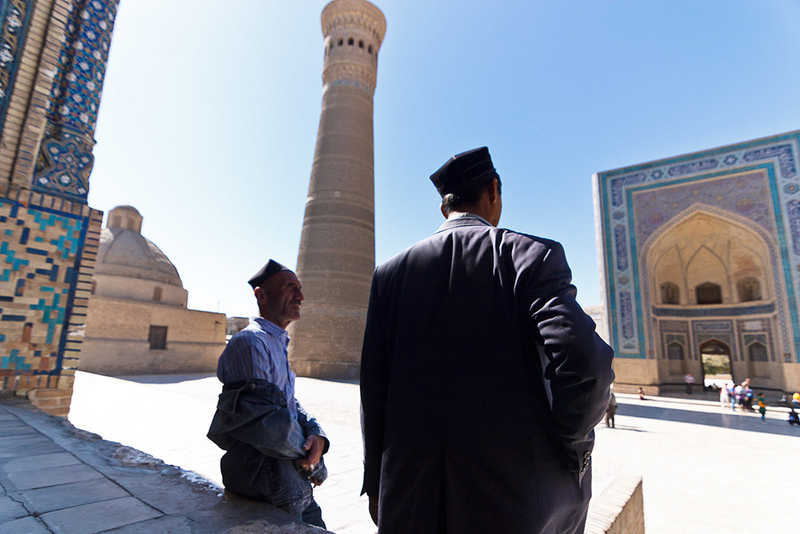 Students who achieve high marks in a Tajik program may be surprised to find that the living language they encounter in Bukhara — where the local dialect is understood as “Tajik” — is very close to unintelligible. To engage on that level, one would have to study language as it is spoken, rather than the language as reformists wish it were spoken. Nor is this situation limited to the former Soviet republics of Central Asia. Although education in formal Persian has penetrated much more deeply in Iran (not having to compete with the imperial language of Russian), Iran is home to a spectrum of local dialects, some arguably more pronounced even than those found in Central Asia. The same is true in Afghanistan, where languages such as Pashto and English provide ingredients for the local dialects. Students wishing to engage with these colloquial forms are mostly out of luck. Language textbooks and programs strictly hew to the tripartite Farsi-Dari-Tajik division, and when “colloquial” elements are introduced, the variant in mind is that of Tehran, masquerading as a common spoken dialect for the language as a whole. There are a few examples of exceptions to this rule, such as the insightful, but difficult to obtain, guide to colloquial Tajik by Aliev and Okawa (Colloquial Tajiki Phrasebook, 2009). For the most part, the anthropologist and development worker (for whom formal Persian may be less useful) are on their own. This need not be the case. If there is one thing that historical scholarship of the last several decades has demonstrated, it is that what we understand today as “nations” and “ethnicities” are the product of contested, and often very recent, historical processes. Those insights have yet to filter into language pedagogy in any meaningful way, but it is not too hard to imagine an alternative approach. Indeed, just such an integrated approach is already on offer – for Arabic. Most Arabic programs focus on the formal language prevalent throughout the Arab world, while concurrently offering targeted introductions to various regional dialects, with special attention to the most prevalent one – that of Cairo. It is taken for granted that students’ journeys are not over at the end of the integrated program, since they will by necessity have to use the formal language as a platform for further specialization in a local dialect, technical field, or literary genre. The only thing holding Persian back from a similar approach is the tenacity of national categories. An integrated pedagogy presenting a shared formal language transcending national boundaries, combined with exposure to regional and historical diversity, would better prepare language learners for realities encountered on the ground, and help undermine the conceptual silos of the nation-state. For now, the DIY version of such an approach is not impossible, but certainly challenging due to a lack of materials. Students would have to strain to cobble together resources across dialects under a bewildering array of contradictory headings. But even a basic appreciation of the limitations of our perceived language categories opens the door to a far more diverse and interesting world. Editor's note: James Pickett is an Assistant Professor in History at the University of Pittsburgh. … Interested in the gory details underpinning the arguments presented here? This article is adapted from: James Pickett, “Categorically Misleading, Dialectically Misconceived: Language Textbooks and Pedagogic Participation in Central Asian Nation-Building Projects,” Central Asian Survey, May 2017.